How long has it been since you rode your bike? Now is the time to dust it off – May is national bike month. Why not participate in Bike-to-Work Week, May 12-16? If that seems a bit daunting, Friday, May 16 is Bike-to-Work Day. Plan your route, tune up your bike, and don’t forget your safety equipment and your lunch! You probably loved to ride your bike as child so have fun as you commute to work! It may become a habit and you could end up with a better body, reduced risk of obesity-related diseases such as diabetes, stroke, and heart disease; more money in your pocket since bikes are more economical to operate than cars; and you will be helping the environment. 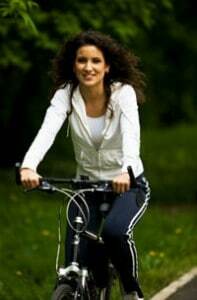 Consult your doctor whenever starting any new physical activity.